Turns out, we’re hittin’ it twice. 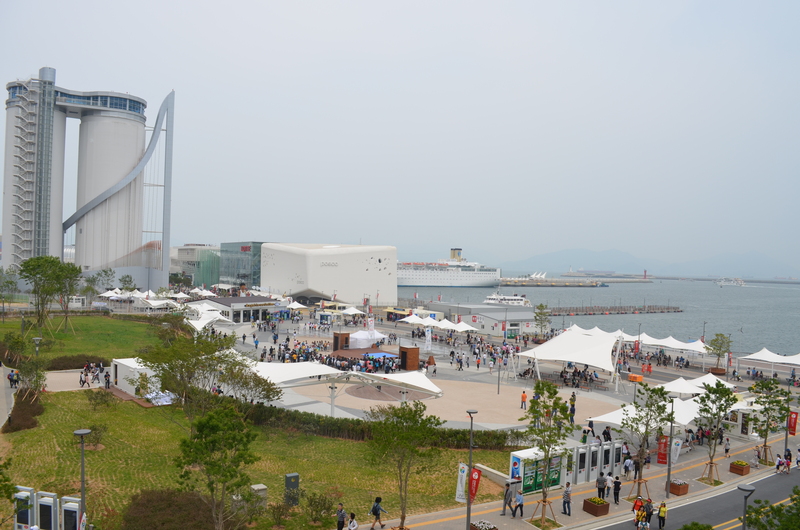 This year, the World’s Fair is being held only 3 hours from here, in a coastal town called Yeosu. 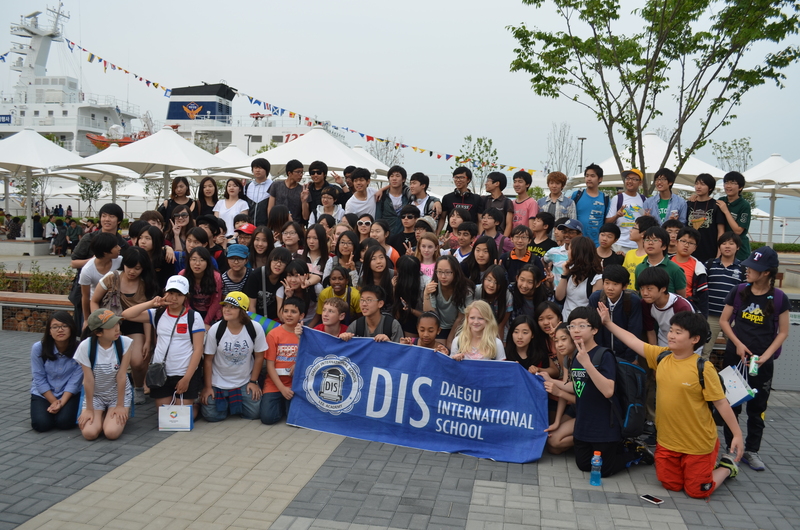 And yesterday, 100 of our DIS students and colleagues got to go experience it! Our caravan of three decked-out buses left school around 8:15am and returned at 9:15pm. What we experienced in between was one for the ‘Best of the Best in Asia’ book of Hamlin. It. Rocked. This is the view in one direction. North I think. Toward the Marine Civilization and City Pavilion, in any case. We were on the EXPO grounds for about 7 hours, and I personally only got to explore Malaysia, Cambodia, the Galapagos Islands, Australia, Russia, the Philippines and Vietnam. Only, she said, with eyelids still dragging. I’m just saying, there were dozens more countries to see, and just not enough time to see them in. Me: Hi! You look winded. Where have you been? Them: We just ran here from Russia by way of Nigeria. Me: Of course you did. We had read in reviews in local newspapers that lines were extremely long, that facilities were difficult to navigate and that there was a shortage of food for visitors. Just one of these was true: lines were long at some of the venues (the aquarium for example) but otherwise, my group only waited about 20 minutes in the longest of the lines we encountered. Most we got into immediately. The grounds were clean, spacious and well laid-out, with plenty of bathrooms, food vendors and places to sit for rest. Which goes to show you: beware the open invitation for review-writers. We almost paid heed to these haters, reconsidered the value vs. possible frustration of taking the trip at all, and are SO glad we decided to go see for ourselves. A good life lesson in general, actually. This is looking in the other direction toward The Theme Pavilion, and The Big “O.” No, I’m not kidding. So there we were, having just gorged ourselves on the most delicious Vietnamese noodles and spring rolls, lamenting our aching bellies, when an American man, by the name of Andrew Snowhite (I know, awesome) approached. He is the CEO of the American presentation hall at the EXPO – and he was stoked to see a group of international students together, laughing, goofing around and clearly at ease with one another. We chatted for awhile about our experiences in Korea and he told us about his. Afterwards, he asked us to meet him in front of the US pavilion for a photograph, and after we did that, he ushered us — past a 30 minute waiting line — inside the US presentation. Andrew Snowhite is the guy on the right. Thanks, Mr. Snowhite! Hands down, it was the best of the international exhibitions. 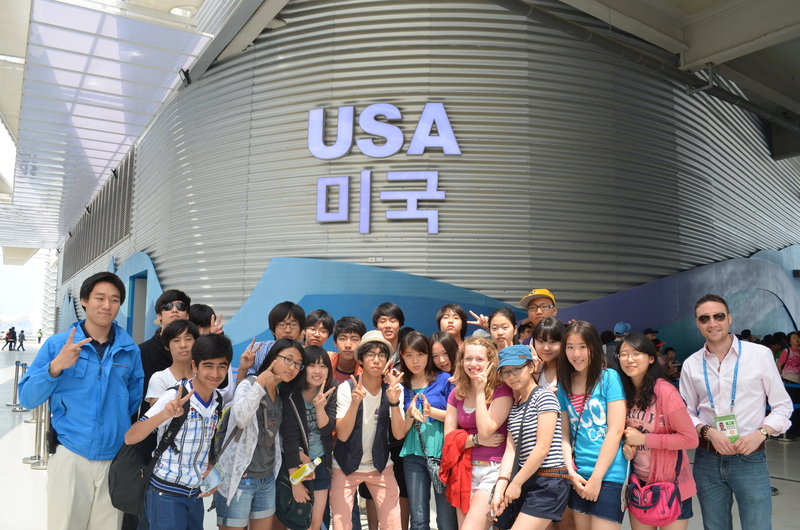 That’s not just my American pride talking, our Korean students thought the same. It was phenomenal — engaging and inspiring — and through an incredible video montage of people all over America talking about “their” ocean and what it means to them (including some footage of the Maine coast), it invoked hope about the world working together to solve the crisis of our planet. Ah, America. Oh, alright. Okay! I admit it. It’s my American pride talking! Anywho. 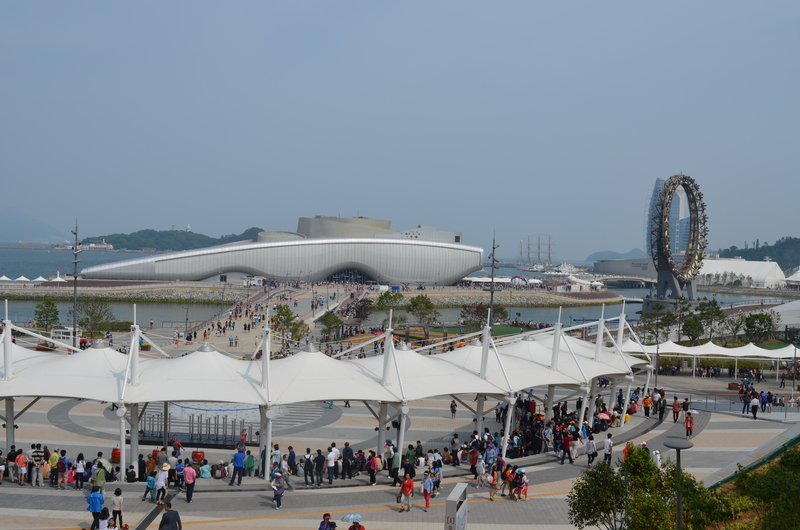 If I spent 3 full days in Yeosu I feel I still wouldn’t have done the EXPO’s World’s Fair justice. Trying to explain it all in a blog is, likewise, a limitation. My advice – if you are anywhere in the world within a reasonable distance of The World’s Fair, go. Don’t think about it – just do it. A good life lesson in general, actually. It was all worth it – for THEM. Thanks for your blog post, Vicki. Glad you had another great adventure. Life can forever be an education if we let it. Hears a great example. Your DIS kids must love you.